What do Jay-Jay Okocha, Kanu, Javier Zanetti, Hernan Crespo, Rivaldo and the original Ronaldo all have in common? 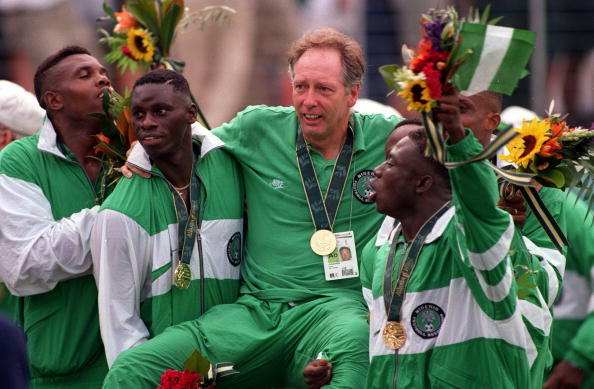 The answer is that they all took part in a terrific Olympic football tournament in the United States in 1996, that would see Nigeria walk away with the gold twenty years ago this week. Football has a long, but somewhat strained, history in the Summer Olympic with early battles over whether or not professionals should be allowed to participate in the games and what in fact defined a footballer as a professional. The timing of the Olympics also doesn't sit well with clubs in Europe in particular, as it clashes with either their preseason training or the early part of their schedules. The importance that nations place on the Olympic football tournament also varies from country to country. 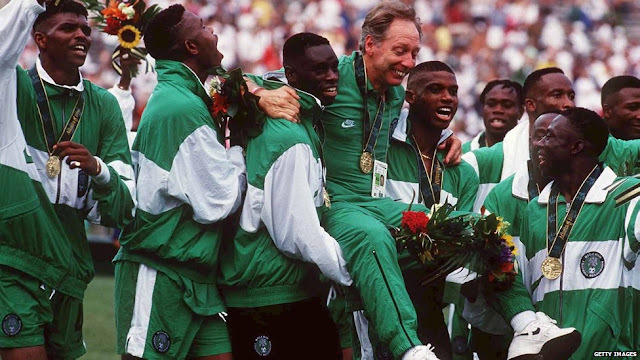 But in 1996 a talented group of youngsters from Nigeria, led by Dutch coach Jo Bonfrere, took their place in America as one of the 16 nations vying for a gold medal. They would show the world that football at an Olympic Games can be every bit as exciting as that which is played at other more prestigious tournaments. Drawn in a opening group containing Hungary, Japan and a star studded Brazilian side, Nigeria saw off the Hungarians with a goal from Ajax star Kanu, and then crucially defeated a Japanese side who had stunned Brazil in their opener with goals from Tijani Babangida and Okocha. Brazil, with a goal from Ronaldo, stopped Nigeria from obtaining maximum points when they defeated them 1-0 in Miami. With Brazil, Nigeria and Japan all tied at six points at the end of the group stage, it was goal difference that saw Brazil and Nigeria advance to the Quarter-Finals at the expense of the Asian side. A fine victory over Mexico, with goals by Okocha and future Chelsea defender Celestine Babayaro, eased the Super Eagles into a return engagement with Brazil in the Semi-Final. 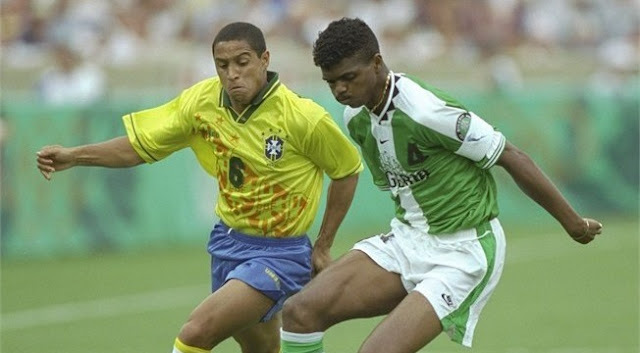 Facing a Brazilian side that contained the likes of Bebeto, Juninho, Dida, Roberto Carlos and Rivaldo, to go along with "The Phenomenon" himself Ronaldo, the odds were definitely stacked against the West Africans. When Flávio Conceição put Brazil up 1-0 with only a minute played, Nigeria's fans surely feared the worst. But with the Super Eagles playing their way back into it, they forced Roberto Carlos to slice the ball into his own net on 20 minutes to draw level. Unbowed, Brazil's 1994 World Cup winning striker Bebeto fired the South Americans back in front on 28 minutes before Conceição doubled their advantage ten minutes later. Up 3-1 at half-time, Nigeria's dream of Olympic gold seemed to be over. As the minutes ticked away in the second half, Brazil confidentially controlled the ball and seemed to be conserving themselves for an eventual final against their old rivals Argentina. With just over ten minutes to play though, Monaco's Victor Ikpeba found the net from 20 metres to give his team a bit of life and then on 90 minutes the impossible happened. Kanu took advantage of a mad scramble in the box to force an equalizer and send the match into extra-time. The 78,587 fans in Athens, Georgia had been treated to a wonderful spectacle and they were in for an incredible conclusion. Only three minutes into extra-time that man Kanu picked up the ball outside the box, dribbled around a hapless Brazil defender before dispatching the golden goal winner. It was truly one of the greatest football matches seen at an Olympic Games. 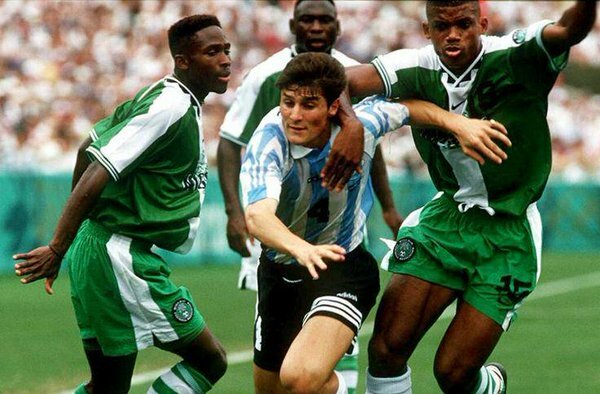 Standing in Nigeria's way in the final though was another glittering side in Argentina that contained players such as Claudio Lopez, Ariel Ortega, Roberto Ayala, Diego Simeone, Hernan Crespo and Jose Chamot in their squad. Again, Nigeria would find themselves down early as Lopez found the net on three minutes to put the South Americans in front. Celestine Babayaro responded for the Super Eagles on 28 minutes and the sides went in at the half deadlocked at one apiece. Hernan Crespo, who would later become the most expensive player in the world, fired Argentina ahead again from the spot on 50 minutes. Taribo West, who would enjoy a fine career at clubs such as Auxerre, Inter and AC Milan, was devastated after allowing himself to get drawn into fouling Ortega in the box. At that point even the most ardent Nigerian supporter could have been forgiven for thinking that their wonderful run was about to come to a disappointing conclusion. But proving that their heroics against Brazil weren't a fluke, Nigeria kept going at their illustrious opponents and on 74 minutes Daniel Amokachi looped in an equalizer over the head of Argentine keeper Pablo Cavallero. Deadlocked at 2-2, Argentina nearly found themselves ahead again soon after Amokachi's equalizer, when Lopez forced a fine save out of Joseph Dosu in the Nigerian goal. Then with only a minute remaining Emmanuel Amunike beat an terribly botched offside trap by the South Americans to seal an unlikely win for the Super Eagles and an Olympic gold medal.